Read more about Rusty Evans’ tribute to Johnny Cash. Listen to Rusty Evans’ sing. Does he sound like Johnny Cash? You be the judge. Elizabeth Hemmerdinger’s Squallâ€”now receiving its regional premiere by Modern Muse Theatre Company at the Arvada Center’s new black boxâ€”breaks this mold, delivering a series of adrenaline rushes as it plumbs the psychological depths of two powerful women stalking each other in cottage on an island just off the coast of Maine during a storm. To read more about this review, check out coloradodrama.com/squall.html. Â Also check out our YouTube video. Come join the Arvada Center as we promote our summer production of “The Best Little Whorehouse in Texas” at Central City’s 33rd Annual Madam Lou Bunch Day and World Famous Bed Race – Saturday, June 16th. We celebrate the life and times of Central City’s last legal madam, Lou Bunch who last appeared on our census in 1910. Costumed locals, rowdy times and our World Famous Bed Race on Central City’s Main Street. Free and open to the public, event begins at Noon! On Lou Bunch Day teams of two men and a woman compete in the annual bed races. The gents, dresed in long johns, take turns pushing the brass bed up hilly Main Street, and rolling in it with the woman, who wears a tightly laced red corset and fish-net stockings for the pleasures of this bumpy ride. Check out the Central City Website for more details on this upcoming event. Come shop for a gift for Mother’s Day, or for yourself. New works by the outstanding faculty and students of the Arvada Center Ceramics studio will be on sale for six days only. These creations range from functional, beautiful tableware to original ceramic sculpture. 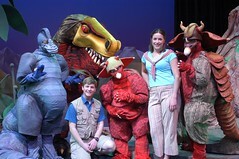 The Dinosuar Play closed today (Friday, May 4, 2007).Â What a great run.Â Thousands of children enjoy this production.Â The cast and crew should be proud of themselves.Â Good job everyone!Â See you in the fall for another awesome line-up of Children Productions.